The sweet potato is a bright orange root vegetable, and is treated in a similar way to butternut squash, parsnips, swede and turnips. Unlike potatoes, these vegetables do count towards your 5-a-day because they are lower in starch than other carbohydrates and are usually eaten in addition to the starchy part of the meal. So, what in particular do sweet potatoes offer that makes them good for us? And what is the difference between sweet potatoes and white potatoes? Sweet potatoes are a source of four essential micronutrients: vitamin C, thiamin, potassium and manganese, which between them have a whole range of properties that our bodies need to keep us ticking over. 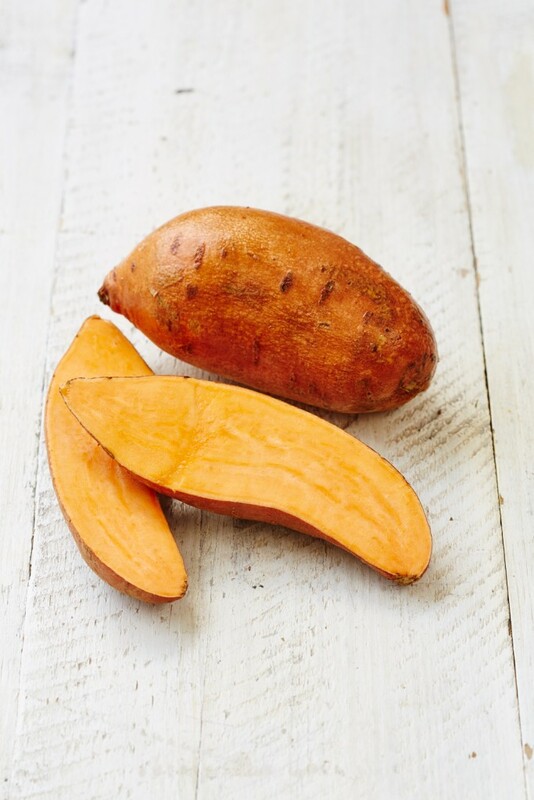 The most prominent nutrient in sweet potatoes is vitamin C: one large sweet potato contains more than 70% of our reference intake, more than double that of white potatoes! Vitamin C’s roles in the human body are vast: aside from the well-known immune system boost, vitamin C is required to maintain our teeth and gums, cell protection, psychological function, nervous system function and it also enhances our ability to absorb iron. Our bodies use manganese for bone health, but also to protect our cells from the damage caused by stress. Thiamin is a B-vitamin that our nervous systems need to function properly, but our hearts also need it to function properly, which makes thiamine an especially important mineral! Potassium we need to keep our nervous systems functioning properly, for our muscles to contract , and also to keep our blood pressure healthy. The other good thing about sweet potatoes is that they are so versatile: you can mash them, bake them, make fries with them, top a fish pie with them, pretty much anything you can do with a white potato. Plus, it’s an almost effortless way to change up from regular potatoes!.